Baseball's most discomfiting buddy comedy is near cancellation: Yesterday, the Baltimore Orioles designated outfielder Felix Pie for assignment, effectively ending his role as the some-of-my-best-friends-are-black clubhouse foil for redneck performance artist Luke Scott. Scott—who made himself briefly famous during the offseason by questioning President Obama's citizenship—told ESPN's Amy K. Nelson during spring training that he would pelt the dark-skinned Pie with plantain chips ("bananas") "whenever he acts like an animal." At the time, the two pals were jockeying for playing time in left field for the Orioles. Scott went on to hit .220/.301/.402, and is currently on the 60-day disabled list after season-ending shoulder surgery. Pie, the former five-tool superprospect for the Cubs, was hitting a mind-boggling .220/.264/.280 when the Orioles finally gave up yesterday. The most hopeful theory about Pie is that he is the kind of player who needs to be in the lineup every day to blossom. The flaw in that theory is that the unblossomed (or not-yet-blossomed) Pie was too hapless to put in the lineup every day, even for a last-place ball club. 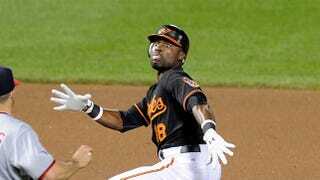 "I kept trying to give him some rope and see if he would run with it," Orioles manager Buck Showalter said. Pie has 10 days to be traded or claimed off waivers, if any other team wants to take a flyer on a 26-year-old who batted .299/.356/.469 in the minors, who once hit for the cycle in the majors, and who put up sometimes spectacular defensive numbers while also sometimes stumbling around the outfield in confusion. You never know! Brady Anderson was pretty awful through age 26, too. Absent Scott and Pie, the role of slugging everyday left fielder who people trust to improve will be played by Nolan Reimold, who hit his eighth home run of the year as the Orioles beat the Twins yesterday and is now batting .223. The role of center-field prospect turned utility outfielder will be played by 25-year-old Matt Angle.